On July 14th, 2017 a classroom full of private investors were about to learn for the very first time about impact investing in Mexico City. At the very beginning of the class they were asked what were their initial impressions of Impact Investments if any. Unsurprisingly, most of them thought it was an asset class; the overwhelming majority thought the term referred exclusively to investment in social enterprises and more than half of them agreed that some return must be sacrificed for social and environmental impact. Two of them even said that almost any investment has intrinsically a positive social impact because it creates jobs and economic growth. I had just come back from the GSG meeting in Chicago the day before, so it is an understatement to say I was on fire to serve the impact cause. What unfolded for them in the next 4 hours was as they described it “mind and soul-blowing,” but a definite climax during the course was the Holistic Impact Investment Spectrum. It was clear, from the participants’ feedback and incessant discussions during the breaks and closure, that a paradigm-shift was in the making. Even the detractors of impact (self identified anti-impact investors) sat closer to the front after seeing the Spectrum; it was a moment of “click” for the class. Those are the moments when looking back you can pinpoint what concepts had served the most to transform investors into impact. This year marks the 10th anniversary of the term “Impact Investment.” The Impact Investing sector has evolved in size and depth; in terminology and storytelling, the successes and the thought leadership. But fundamental debates are still on-going regarding the evolution of impact metrics & management, common values, definitions and more importantly if we are winning battles but losing the war. Amit Bouri, the CEO of the Global Impact Investing Network wrote in a very inclusive article an invitation to the Impact sector to be welcoming to bigger capital in an effort to solve the magnitude of the problems we face. So precisely because we need to rethink the way we use capital, lets propose an evolution: a complementary Spectrum to accompany the usual impact spectrum. The usual impact spectrum is a spectrum from the point of view of financial returns. It helps us illustrate and enunciate the layers of opportunity that come between philanthropy and “Business as Usual”. While it is very helpful and used across the world, it only provides the financial return perspective, not the impact one. How can we explain Impact Investment beyond the focus on financial returns? 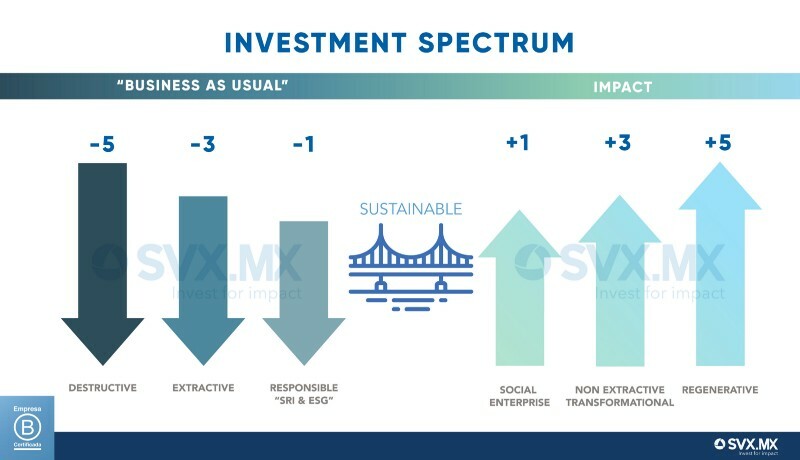 What if we were to explain Impact investment as the spectrum of commitment to positive outcomes, instead of the spectrum of financial return expectations? If we were to explain commitment to impactful outcomes in a spectrum that takes into account that ALL investments create impact (intentionally and accidentally), and that these impacts are not just absolutely bad or absolutely good (black or white) but many shades of grey in between: some are mostly positive impacts vs mostly negative impacts. How do we net out how much positive impact is needed to outpace the negative impacts of a company or sector? Will we keep going with development outputs (number of jobs, GDP) and growth as an end goal, or can we change course towards wellbeing and balance, which are not coherent with endless growth? For example, how much “good” does a food company that profits from selling junk food need to do to offset the negative health outcomes associated with its core business? How much is the positive impact of a “financial inclusion” company that charges over four thousand percent in interest rate and how much are the negative outcomes of such a company? Here lies the fundamentally philosophical question of what impact investment means by attempting to help make a better world for everyone. What is the maximum expression of all that is good in the world? Could it be life? What about the expression of all that is negative? Could it be death? Which investments are conducive to life and which are conducive to death? What about all the layers in between? If we want our impact investment strategies to translate in real long term results we need to start with coherence to universal values all throughout the strategy. Transversal coherence can translate into trust of the impact concept by more stakeholders that can ultimately lead to the most impactful results. An alternative to these universal values could even include: Death, War, Injustice, Control, Dependence and then on the positive side: Interdependence, Freedom, Justice, Peace and Life. ImpactAlpha published 2 months ago our Manifesto, claiming for outcomes instead of outputs for the SDGs ( United Nations Sustainable Development Goals), as I wrote about the danger of making the outputs an end in themselves instead of the ultimate desired outcomes for the world. I wrote it thinking we aren’t here to make the world “better”; we are here to make the world the best imaginable place for all. So what investment spectrum do we need to get to best for all? in PHILOSOPHY- characterized by comprehension of the parts of something as intimately interconnected and explicable only by reference to the whole. in MEDICINE- characterized by the treatment of the whole person, taking into account mental and social factors, rather than just the physical symptoms of a disease. We start by dividing the spectrum in 2 halves. The left half subtracts value from the world while the right half adds value to the world. There is a bridge from one half to the other. The right half has positive impact in every layer but in different degrees of benefit to the world. The sustainable bridge appears in the middle because it is the promise of survival, prosperity comes after survival in several forms. First we need to be sustainable, urgently, then we can move to higher forms of wellbeing. Transformation is a fundamental step in order to get to regenerative. Destructive: These are all investments that create conditions for death which include: all government budgets destined to war, companies that produce weapons, money managed for cartels and human trafficking. According to a portfolio of stocks of such companies named “Guns, guards and gates” this asset class is underperforming the market by more than 15% basis points this year. Can prisons qualify in this category? Are they destructive (generating death) or extractive? we would need to measure real data to find out. Extractive: This is by far the largest in size of the classifications of the spectrum. By extractive we mean unsustainable investments that are wealth-depleting: they can create short-term profit and benefit through the extraction of resources from the system but ultimately deplete rather than grow the overall wealth of a system. Naturally most people think of oil & gas and mining immediately after hearing “extractive”; but this can also include junk food companies, fast fashion companies, some banks, some manufacturing companies, some retail companies, some chemical companies, most of the paper and wood industry, most construction companies, some forms of industrial agriculture, slaughterhouses, and any company that has no regard or responsibility for the negative externalities it causes. Surprisingly, doing the math, some forms of microfinance, some forms of tourism, most of the beauty, cosmetic and pharmaceutical industry, can also be extractive. Indeed they add jobs to the economy, but they also produce large amounts of poorly-managed waste, and not all companies have working conditions that allow for wellbeing all throughout their supply chains. As long as the net effect of their business is larger on the extraction than on the value it creates for the world, the net effect is extractive. These businesses treat nature as a warehouse for raw materials and treat workers as mere labor without regard for covering beyond their basic needs stipulated by government regulations, and even sometimes puts its workers or communities at risk. Extractive investments are degenerative in nature and consume more energy and materials the more they grow. An index or ETF to exemplify this industry can be the SPDR S&P Oil & Gas Exploration & Production ETF which in the past 3 years has lost 59.2% of its value. Responsible: There are plenty of indexes and certifications for measuring responsibility and ethical behavior in companies and ESG screens and practices that reflect: Environmental Social Governance. The degree of responsibility that each certification dictates varies greatly. We can be certain that companies with these labels and certifications are taking care of doing less harm in one aspect or another, but we cannot be certain that this category means these companies are benevolent to the world around them. For example some companies can show compliance to gender equity quotas in boards or top level management but might still have salary disparity among female and male workers. Some “responsible” indexes are more questionable than others; I was looking into a very prominent bank’s “green & responsible” investment portfolio and the company that weighed the most in their index was a tobacco company. In the Mexican Stock Market the Sustainability + ESG index features companies that have current corruption scandals with the government, together with some of the highest polluters of the country (even the ones that have poisoned complete rivers). It could very well be that it is an index of the companies that are trying the hardest to be responsible. Who knows for sure. Sustainable: With a higher degree of commitment than Responsible companies, we define sustainable investing as fully integrating environmental, social and governance factors — ESG factors — into investment management. Strategic sustainable investing (SSI) is an investment strategythat recognizes and rewards leading companies that are moving society towards sustainability. SSI relies on a consensus-based scientific definition of sustainability. It was developed by researchers at the Blekinge Institute of Technology in Sweden. According to the study From Stockholder to Stakeholder: How Sustainability can Drive Financial Outperformance from Arabesque Partners and Oxford University, Sustainable investing outperforms regular investing in the long run. Examples of this kind of investment are Green Bonds, among many others that commit to cutting carbon emissions or reducing the water footprint of their companies. Impact Venture or Social Enterprise: These are companies that are intentionally solving one or more social and environmental problems. According to Wikipedia: A social enterprise is an organization that applies commercial strategies to maximize improvements in human and environmental well-being — this may include maximizing social impact alongside profits for external shareholders. Some of our favorite examples include: Someone Somewhere a Mexican brand that empowers women artisans through education & incorporation of their textiles in fashion items, Hipocampus community centers of learning for young children that started in India and scaled to Mexico, Algramo from Chile which provides multiple solutions to empower mom & pop stores and decrease the poverty tax and packaging pollution in low-income communities. Social Enterprise is the most well-known classification of Impact Investments. It is composed of thousands of companies, funds and organizations that serve underserved markets, and usually look for market based solutions to solve the worlds’ intractable problems. Some of these companies have measurable impact with globally common metrics: such as B Corporation, IRIS among others. Communities should be engaged in the design, governance, and ownership of projects that affect them. Investments should add, rather than extract, value to the communities where they are deployed. Risks and returns need to be fairly balanced between investors, entrepreneurs, and communities. These principles can be summed up in the phrase: “nothing for me without me.” These investments are rooted in social justice, and they offer a roadmap for impact investors who aim to transform rather than help. It means giving real agency to and drawing leadership from the affected communities. It also includes models of descentralized ownership now popularized by movements of Platform Cooperativism, blockchain and other models that rather than aim to concentrate the wealth created, aim to distribute it. The origin of the word company comes from the latin of sharing bread; Non-extractive finance goes back to that original meaning and brings it to our century. To learn more about this world-changing approach we recommend reading the book: Real Impact by Morgan Simon — The New Economics of Social Change and the provocative article that started the Zebra Movement and challenges ideas of scale, exponential growth and Unicorns: Zebras fix what unicorns Break. Some examples of Non-extractive finance can be seen in The Working World Fundwho pioneered principle #2, Uncommon Cacao, Grupo Paisano from Mexico, and Impak Finance + Impak Coin in Canada– the first legal cryptocurrency for impact, Sardex, the revolution of local value creation that empowers communities and started during a crisis in Italy, among others featured in the book Ours to Hack and to Own, and others that use alternative financial structures to include more stakeholders (than just the investor + the entrepreneur) into the investments. 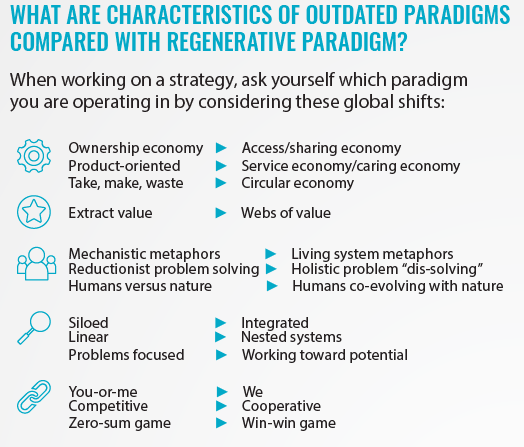 Regenerative: Regenerative Capitalism seeks balance and wellbeing instead of indefinite growth, it involves systems thinking and views wealth holistically. According to the NEXUS Lab on Regenerative Culture: Regenerative culture is based on an understanding that humanity and nature are inextricably linked and seeks to support alignment of financial and economic systems with earth’s healthy systems. Through the study of the unifying principles of regenerative systems, a new picture of humanity’s place in the world emerges: Regenerative thinking reorients human beings as a restorative, beneficial and healing force for all of humanity and the planet as a whole. This is a re-identification of humanity as the planet’s “immune system” rather than its self-destructive cancer. As you can infer, understanding this kind of investments involves shifting paradigms, changing mental models, and evolving some very material concepts such as supply chains to supply webs. As Liora Adler, wisely states: “As the definition wealth and capital is expanded to include more than money can measure, value becomes more visible. With a holistic look at the economy, through asset-based planning and quality community conversations, much more wisdom can be harnessed. Connection is the source of value. Poverty is a result of disconnection, from spirit, body, emotion, family, and community, and especially disconnection from the earth. Through wise use of technology, people are moving from fragmentation to interrelatedness. (what is also called Interdependence) Relationships have been commodified, and through meaningful exchange of words and value people find connection. Some examples of Regenerative Capitalism are Terra Genesis, CyclEffect, many forms of permaculture, Alternare in Mexico, Savory Institute, the Blue Economy by Gunter Pauli, Ejido Verde, Thimble Island Ocean Farm, some forms of circular economy, some forms of Green infrastructure and Vertical forests by Stefano Boeri. To learn more about this exciting new frontier for investments we recommend reading Regenerative Capitalism by John Fullerton, Doughnut Economics by Kate Raworth, watching the beautiful documentary: Demain. Reading The Gardens of Democracy where we can learn to evolve from a machine-brain to a garden-brain, among other very needed mental hacks to achieve a degree of consciousness that allows for regenerative thinking and acting. In conclusion this spectrum takes a holistic view of whole value rather than just shades of financial returns. This journey is the process of how the venom can turn into the antidote: how human business can be positioned as the antagonist and how we can all turn it into the actual solution to the world’s problems. As Adam Kahune states: If you are not part of the problem, then you cannot be part of the solution you can only be part of the solution if you are part of the problem. At the end of the Impact Investing class I challenged the classroom full of private investors and asked them what type of investor they wanted to be? the SMART investor that invests in future trends? the INTELLIGENT investor that invests for impact? the WISE investor that invests to transform systems through Regenerative principles? The Smart person knows how to take advantages of opportunities, usually from an ego-centric point of view; Intelligence is measured by the ability of solving problems, so we assume problem solvers are intelligent and think longer term than plain smart people. The wise person is enlightened by a higher degree of consciousness and by an eco-centric point of view that allows to see beyond themselves and beyond shortermistic constraints. They can see the system and act accordingly. Guess what their answer was? What will your answer be? We have plenty of work to do; let’s get to it! We have been honored to work with some of these transformative people & organizations mentioned here and know there is much more to learn from them. In SVX Mexico we would love to partner with you to publish a study to validate this new spectrum. If you are interested in collaborating or have thoughts to share please join us here. This post originally appeared on Medium; it was written by SVX Mexico Founder Laura Ortiz Montemayor and is republished here with permission.